THE Methodist Boys School has been an institution of culture and tradition for over a century and today under the Methodist Boys’ School Old Boys Association (MBSOBA) newly formed management team, the school is set to preserve that tradition for the future generation. 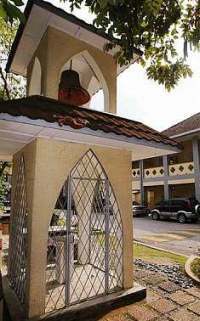 The school’s bell tower that was rebuilt by MBSOBA. Pride was written all over the face of Davy Woo Nam Seng as he stepped inside the premises of the 107-year-old Methodist Boys School (MBS) in Kuala Lumpur. Woo, 54, returned to his beloved alma mater for a visit with two friends and fellow old boys, Patrick Onn Tze Meng, 60 and Jeffrey Yue Sau Hung, 58. The three felt like school boys again as they stopped by the bell tower, which used to signal when school was out and break time. “The bell was broken at one time and was repaired and installed again sometime in the early 80s,” recalled Yue, as they walked further towards the old school hall. They stopped to look at a plaque above the door on which were engraved the school’s motto in Latin Ora Et Labora. “Work Hard and Pray Hard,” translated Woo. “Not play, pray,” joked Onn. The trio could not help reminiscing their days at the school in the early 50s. “Remember the time when we used to sneak sweets into school?” asked Yue. “We also used to bring our tops and marbles to play in school,'' chipped in Onn. “Yes, I also remember the time when I used to line up to get free food that was meant for poor students,” Woo recalled. Today, all three men are prominent businessmen and are also key members of the Methodist Boys’ School Old Boys Association (MBSOBA). Woo is the president, Onn the vice-president and Yue the immediate past president. Though MBSOBA was set up about 56 years ago, it was only recently under the new management team that its activities have increased. 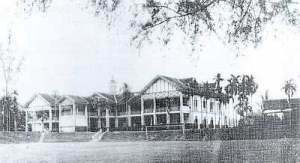 The Methodist Boys’ School in 1904. It has been said that that the life of an institution is provided by the people belonging to it. For an institution like MBS, this cannot be truer. Former students like Woo, Onn and Yue, former teachers and principals have formed an integral part of the institution and have made it what it is today. Since its founding, the education provided by MBS has been about providing a holistic development for students past and present. “We aim to support and uphold the traditions of the school by producing students who are not only good academically but are holistic individuals who will contribute to the growth of our nation,'' said Woo. He pointed out that MBS was one of only three top schools in Kuala Lumpur in the old days. The other two were Victoria Institution and St John’s Institution. Parents would scramble for places to ensure their children were enrolled in these schools. Methodist Boys’ School, for instance, had been one of the top choices and for good reasons too. The school has produced the likes of Genting Group of Companies chairman Tan Sri Lim Kok Thay, Deputy Higher Education Minister Datuk Ong Tee Keat, Foreign Minister Datuk Seri Syed Hamid Syed Albar, Japan-based scientist Professor Foong Foo Wah and Public Bank MD Datuk Tay Ah Lek. Even the new MBSOBA management committee comprises a team of young blood comprising automotive consultants, advertising consultants, remisier, lawyers, accountants, company vice-presidents and CEOs. 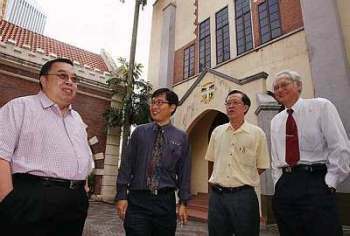 The school’s current headmaster Wong Chee Kheon (second from left) with the old boys (from left) Woo, Onn and Yue. “Never before has MBSOBA had such a balanced team of professionals and entrepreneurs serving in the management committee than now and members are younger and definitely more energetic. “This is good as we live in an ever-changing environment, hence the need for the younger generation to keep up with the flow of new ideas and advance technologies,'' said Woo. Woo said the new team would striveto ensure that character building, good moral, spiritual, emotional and physical development and the pursuit of academic excellence were among the intrinsic items in the agenda pursued by past principals and teachers. “We want to help the school to better network, create activities and events to help the school,'' Woo said, adding that some of the activities include the hot meal programme, moral classes, career talks and sports clinics. The Hot Meal programme provides 35 hard-core poor students from both primary and secondary schools with a meal a day at the school canteen. Other core projects are the badminton clinics, football, chess and judo, which are in the process of being implemented. “We have arranged for former national players like Yew Cheng Hoe (who played in the 1967 Thomas Cup), James Selvaraj (ex-national shuttler and Thomas Cupper and a semi-finalists in the All England Open Invitation), Dennis Lee (ex-state player) to train a select group of badminton players from the school,'' Woo said, adding that similar arrangements were being made for football, chess and judo. But more importantly, the management committee has formed a new set of visions of MBSOBA, which enables every member to chip in and play a role to achieve the objectives of the association. The visions include supporting the school in studies, sports and moral activities, promoting interaction of fellowship and networking among fellow former students, achieving financial self-support for MBSOBA and upholding the school’s good name. “A lot of people probably do not realise the important role we play but the work of a strong old boys association can yield results for a long time to come and we intend to do that,'' said Woo.